upgraded my ancient Tek 465 analog scope with a digital storage scope - a Hantek DSO-5102B. If you are looking for a mid priced scope with serious capabilities, this is one to look into, IMO. I did some bench work lately on a QSK board profiling the FT2000 and a add-in board for my Alpha where I refitted a QSK capability. To test the relay sequence timing, I really needed to have some ability to capture and view the one-shot event. And to easily put those screens up on the web. Only a digital storage scope does that well. The old Tek had a long-persistence analog “capture” function but it was not nearly good enough for the task. It was that project that really got me to thinking about upgrading the shack bench scope. 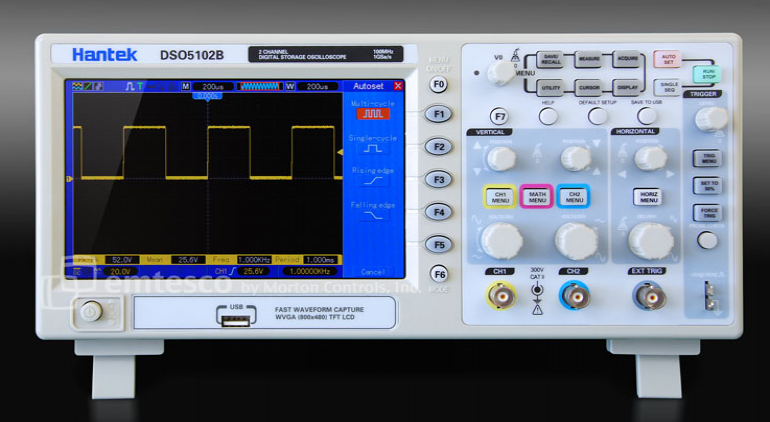 Before buying this one, I had my eye on a Rigol DS1052E DSO. I was thinking about various options but had finally decided on the Rigol after seeing a lot of good press about that DSO on the web – and then I saw that Wes Hayward W7ZOI (the guy who wrote Experimental Methods in RF Design) used the Rigol in one of his articles on a review of Kees Si570 oscillator. If it’s good enough for Wes, then is way way good enough for me. hi hi. The Rigol is generally considered the popular choice as far as I could find out – it’s got good construction and performance. And seems especially popular because the 50 MHz rated scope has a firmware update floating around on the web which would get it to run at 100 MHz. But just before buying, I found the Hantek and saw some web comments on the screen contrast being very good. And having seen a smaller screen on another unit that a buddy had, I really wanted a big high-res screen. The Hantek had a 7” unit but was a bit more expensive. After comparing and hunting on the web, I bought the Hantek. Primarily for 2 reasons - it’s a true 100 MHz rated scope where the Rigol is half-speed (no firmware tricks needed with the Hantek) - and because the Hantek has a 800x480 7” LCD vs the Rigol with a much lower res 320x240 5.7” display. The best part – and the reason for this message – is that the sale price running on the scope (till 1/1/2011) is about $520. The better screen, higher bandwidth capability made the Hantek a better value for my shack than the otherwise FB Rigol. 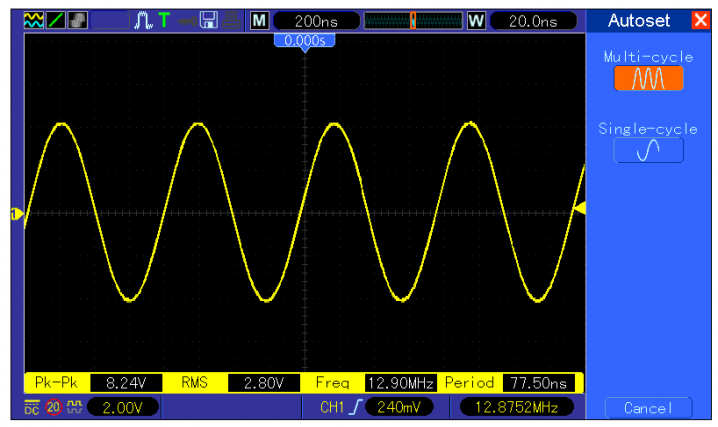 Compared to my Tek, it’s very cool to have an automatic reading of waveform attributes. And the storage capability is just fantastic. Welcome to the modern era! I will be using it in the future to put scope traces where needed on my web site - which is very cool because it has a built in screen capture function that dumps the screen to a USB thumb drive. And (an unexpected surprise) is that the scope has a basic FFT capability which allows it to serve as a sort of basic spectrum analyzer. The scope is a linear responding device and so the dynamic range is only about 20 db, but given the capability basically comes at no added cost, it’s a very cool adder. There are 3 flavors of this scope, a 60 MHz version for almost the same $$, and a 200 MHz for a little bit more. 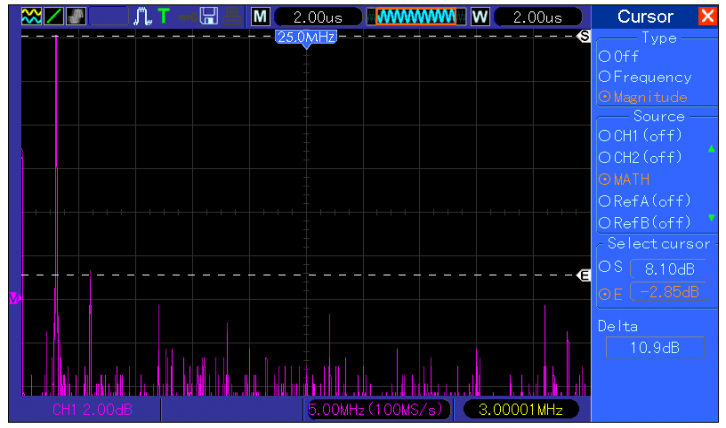 I bought the 100 MHz as I don’t typically need to work above HF. Stick to the “B” series versions – the “C” series is a cost-reduced version with a much lower sample rate – it’s not a superior product. Finally, when Emtestco shipped my scope, the charge was minimal for the UPS ground shipping – and the box went out the same day I ordered it. Excellent service. It is not often that I buy something that I am as happy with both in terms of the gadget and the value. My new RX ensemble is one. And the Hantek DSO is another. What I most wanted out of a digital scope was the ability to capture events that were one-time. Here we are looking at me touching the scope probe to the cal jack. “T” is the start of the trigger cycle. The jagged edges you see are the intermittent contact the probe was making while I was moving it into position. Note - the screen as seen on the scope is perfectly crisp. The picture here is a bit fuzzy because of the resizing that the web site does. 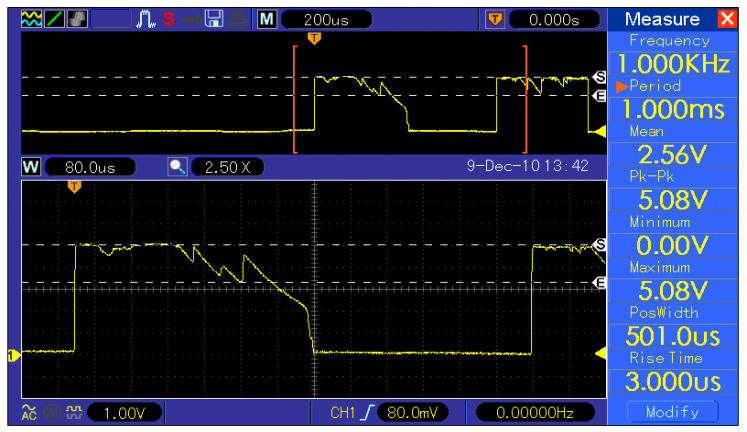 The cursor let you measure on screen the voltages – and you can scroll back and forth along a time line (top) which shows the zoomed part (bottom). Both of this is probably passé to guys with real gear but is very cool for the antique gear crowd (me). The scope does automatic measurement of the waveform it is measuring although I think I can make it point to a section of screen as well – have to violate the protocol of men and RTFM to do that though. Lot of one-button kind of automatic set stuff which avoids the usual search and trim with the horz/vert division controls – here it’s measuring the rise time. I expanded the horizontal a bit to get a better look at the waveform. The FFT feature is real an unexpected benefit. I don’t think it’s going to cause anyone to give up their HP but for quick checks, looks like a great tool. 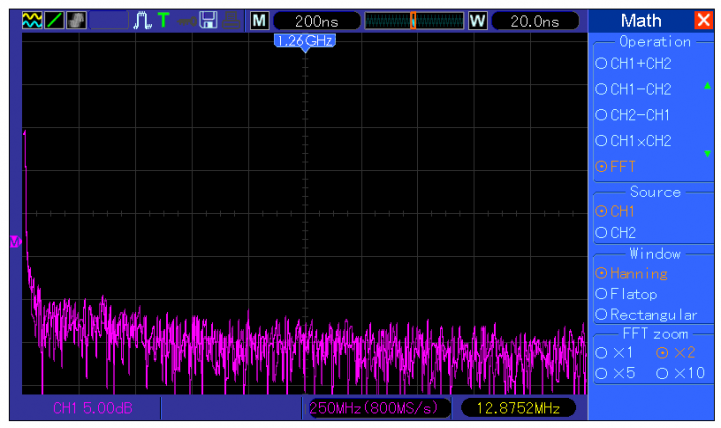 Here’s a 3.5 Mhz output of my Si570 generator – no filtering. 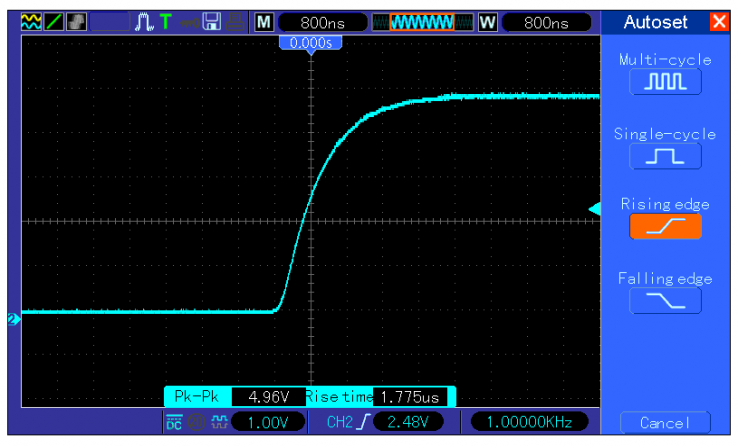 From the cursor settings, the 3rd harmonic is around 4db down from the fundamental (-30 dbm input level). A square wave is made up of strong odd harmoic content so the display is what I would expect when looking at the square wave output. 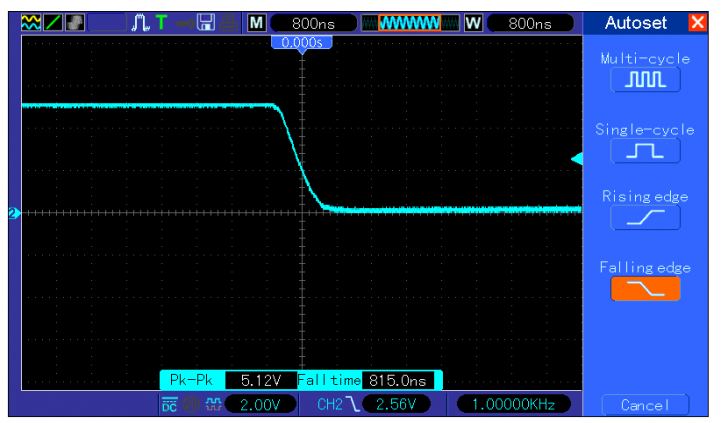 And the FFT of the crystal oscillator… It's actually around -50dbc so again the scope confirms at a macro level what you would expect based on what I know the actual signal looks like from a spectral standpoint. 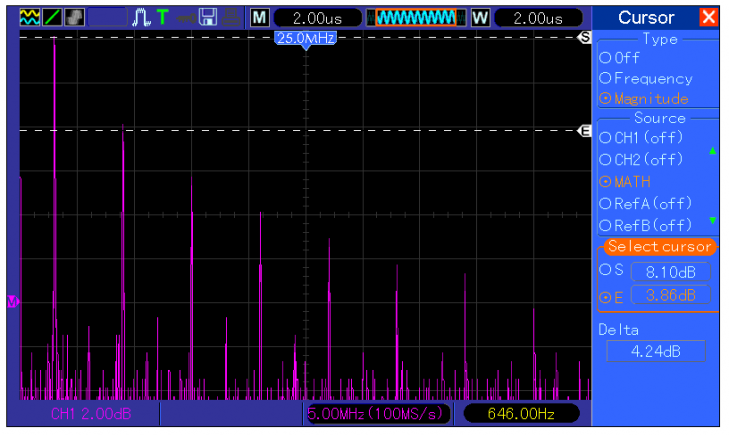 For real RF work at low levels, the 10x probe is not going to do the job. Had the same trouble with the Tek. Solution? High-z amplified probe. Problem? A commercial quality amplified probe can cost $1000. So I have another project cooking to go with this scope - a simple high-z test amplified probe - more on that project to follow. Update on the RF probe. 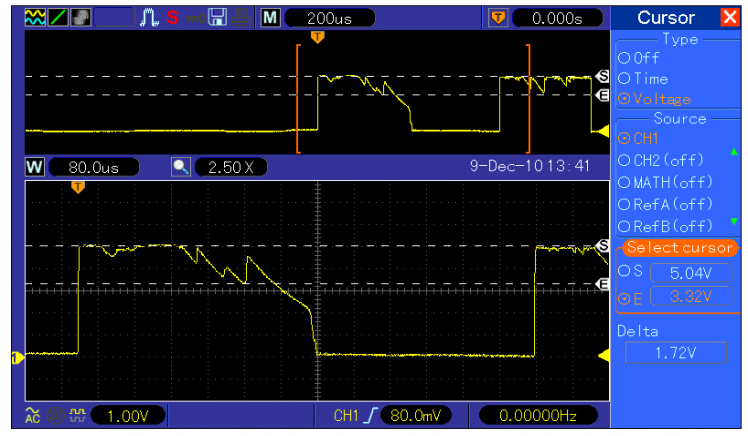 After playing around with building a buffered probe and coming to the conclusion that getting flat, high-Z response is a lot harder than it would seem to be, I eventually bought a Ramsey Electronics that works well - and its cheap as test gear goes!